@stargazer Mobile pack, esp. front row. Not much subtlety in backs. @pakman Agree, although I like both wingers. 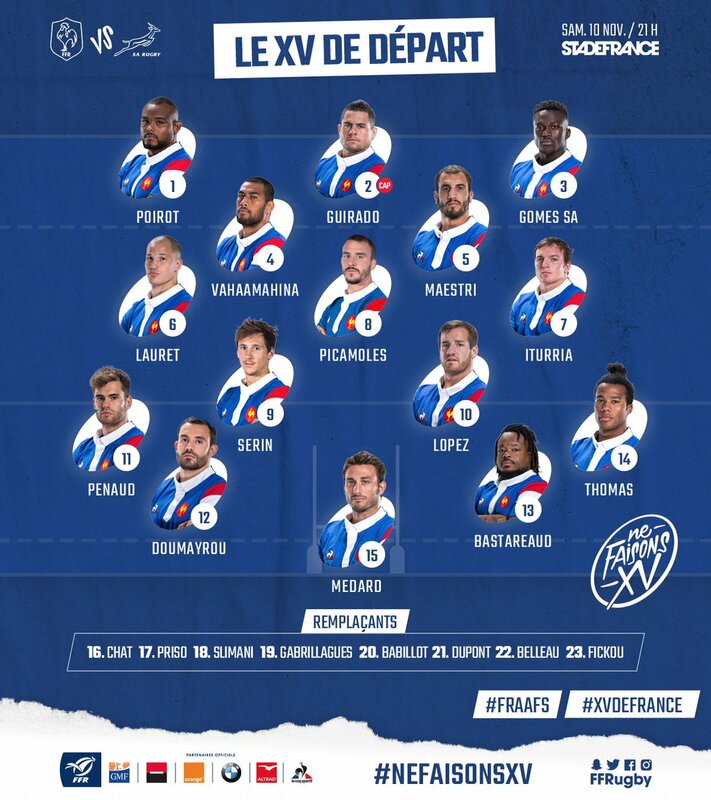 It's a pity Fofana is injured. I don't like Duane Vermeaulen at no.7. He is one of the better no.8's in world rugby - well, at least in terms of how the Boks like to play - so playing him out of position makes no sense to me. I'd have Whiteley on the bench, Duane at 8 and Louw in at 6. (Kolisi to 7). Pity the angry giraffe (aka Etzebeth) is crocked but the rest of the team about as good as we can put together at this point. Is De Jagger injured? Locks a little lightweight. At full strength, Vermuelin, Du Toit and Louw are probably best specialists in back row, but place needs to be made for Kolisi. I can't say with 100% certainty, but no, I don't believe Lood is injured. I think Rassie has gone for a more mobile pack this time - including a specialist loosie on the bench. Not sure why the big switch from last weekend where he overloaded on the beef... maybe he feels we can run the froggies off their feet? Which would be surprising. I believe there is rain in the Parisian air predicted for Saturday. But given that I was not offered the job of Bok head coach for reasons still unclear to me, I am going to have to work on the assumption that he knows best. You do realise that SARU monitor posts here and have probably assessed your knowledge and ability? Did the same assumption apply to P Diddy and other previous coaches? Assistant coaches like Stick? If SARU knew how to switch on a kettle I'd be surprised, never mind actually accessing the digital revolution. Never had to worry about P Diddy. Fourie du Preez pretty much ran the show during his tenure. Stick: yup, same assumption applies I am a fan. Bit inexperienced when first thrust into the role, but loads of potential. I forgot the old 'P-Diddy'. Best coach nickname on the Fern. @crucial I thought it was P-Divvy? I stand corrected. Of course. This oldtimers takes a few coffees to combat in the morning. Yeah - but P.Diddy works better. Can't believe it has taken us this long to come up with it. When "Divvy" means total idiot in England I feel you may be wrong.